It is summer. I am off schedule with the blog. In the past, that would have stressed me, but no longer. It’s just a natural part of life. It is a natural occurrence of the change in seasons, change in schedules. Life is a little less hectic and the daily routines a little less hurried. The lack of schedule affords more time for play, projects, and my favorite-reading. I always get a little more reading in during the summer months. I also find, that summer is often my time to dream-dream about the year to come, dream about what I want to do to the house, with the yard, etc… Reading, reflection prompt dreaming. 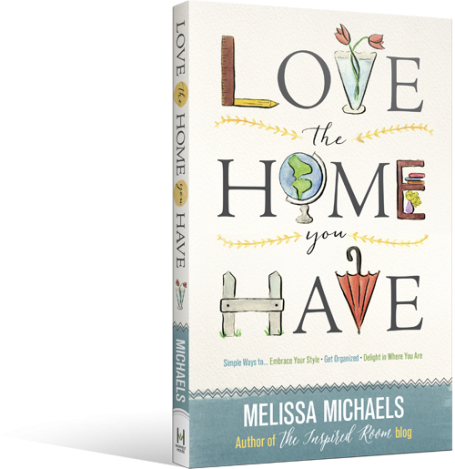 Today I want to encourage you to get a copy of Melissa Michaels’ book, “Love the Home You Have”. Mrs. Michaels is the author of the blog “The Inspired Room”, which I have followed for some time. I absolutely LOVE this book. I have long had a love affair with home. Even as a young girl I loved arranging my room, creating order in an effort to have my own haven. I love home. I love creating home. But, and there always seems to be a ‘but’, I can get sucked into the world of discontentment. I can find myself procrastinating, slipping into a home care slump, while I yearn for that new couch, piece of art I can’t afford, … I can find myself living the comparison game thinking my space is inadequate. It’s a trap. Too many of us find ourselves there. Some use it as an excuse to give up: give up on decorating, cleaning, hosting. ” Love the Home You Have” reminds us what home should be about. It encourages us to breathe, play, collect and enjoy the process of creating home. I have often believed our homes are a reflection of who we are-really who we are. They reflect the state of our spirit, our priorities. As we settle in to who we are, learn contentment, it is reflected in our homes. We worry less about the things we don’t have, and value what we do have. We embrace our style, our likes, and that is reflected in how we care for our home, the treasures we display, the furnishings we choose. A house full of clutter is often a reflection of someone lacking direction, someone living with stress as the result of an overbooked schedule. A house where furniture is falling apart, floors are dirty, the kitchen sink is piled high all the time, is often the reflection of someone avoiding , someone avoiding discipline, trying to find purpose, struggling emotionally. A house that seems cold, void of personal items, can be a reflection of someone desperately trying to control all of life, function in their own strength. Truth be told, our homes at various times can reflect all of the above. The condition of our homes reflect the condition of our spirits, our hearts. “Love the Home You Have” not only shares ideas on how to care for and create a place of beauty and peace, but encourages us to care for ourselves. Mrs. Michaels encourages us to find contentment, not just with our homes, but with the person God created us to be. No home is perfect, believe me I have built 5 and still haven’t gotten it 100% right! My budget will never afford me the opportunity to buy what I want when I want. My love of hospitality means my home is often full of people, and things get dirty when people fill your home. Just as I live and breathe, so does my home. As I grow, mature, so does my home. As I release worldly expectations, I am free to create, find joy in the quirky parts of life and home. “Love the Home You Have” is full of decorating ideas, home management ideas and personal care advice. No matter where you are in the ebb and flow of loving your home, I encourage you to order your copy today.